by by Dr. Darren Burke, Ph.D.
As summer approaches most of us begin to think about what we’re going to look like out on the beach with our shirts off. We all know this is the time to impress the ladies with a chiseled body — but are you going to be showing off a solid six-pack? Or, like most of us, could you stand to lose a few pounds and tighten up your mid-section? If you’re looking to shed a few pounds and carve out a washboard stomach then the easy-to-follow plan detailed here is exactly what you need to get on the fast track to success. The plan includes five easy-to-follow diet strategies that will help you shed those extra pounds in no time at all. 1.) Eat more frequently throughout the day. Ideally, you want to eat four to six meals every day. This can include your three main meals plus two or three snacks. By eating more frequently you increase your metabolic rate and burn more calories throughout the day. 2.) Try to have a good source of protein at every meal or snack. Eating protein has a greater thermogenic (calorie-burning) effect than eating carbohydrates or fat. Therefore, by eating more protein you can give your metabolic rate a significant boost. Some good sources of protein include chicken breast, beef, salmon, cottage cheese, yogurt, and whey protein powder. 3.) Eat vegetables with at least three of your meals each day. Veggies are not calorie dense, but do contain a lot of important vitamins, minerals, and fiber. Veggies will fill you up and help stop you from overindulging on the “bad” foods. 4.) Have some ‘healthy’ essential fats with each meal. Yes, I’m recommending you eat fat to burn fat. It’s true — certain fats can actually help enhance fat loss. More specifically it’s polyunsaturated (which are essential fatty acids) and monounsaturated fats that have a host of health benefits and can also support fat loss. Some excellent sources of polyunsaturated fats include fish, flaxseeds, pumpkin seeds, and walnuts. Almonds, pecans, olive oil, and avocados are great sources of monounsaturated fats. 5.) Drink lots of water! Just like food, water can also have a thermogenic (calorie-burning) effect on the body. Drinking cold water has actually been shown to significantly increase metabolism. Simply put, a more hydrated body is more metabolically active. 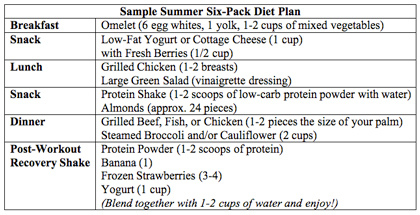 The sample diet plan outlined here is based on the five strategies I’ve just explained. This plan is designed for a 180-pound male. So, if necessary, slightly increase or decrease the portion sizes relative to your current bodyweight. Dr. Darren Burke, Ph.D. is a former nationally ranked athlete turned university professor and research scientist. His papers are published in peer-reviewed scientific journals around the world. Dr. Burke is also the Founder and CEO of a new innovative supplement company, RIVALUS Inc.